Posts tagged with "young money"
This entry was posted in Design and tagged 360 Magazine, asia, barbietingz, beautiful, Celebrity, Cory couture, culture, Diana Macaraeg, editorial, fashion, Global Society, Greg swales, Harper's Bazaar, kc Jones, lifestyle, Nicki Minaj, Phillip plein, pop, rap, Southeast Asia, Vaughn Lowery, Vietnam, Wilhelmina, young money on October 5, 2018 by wp360mag. This entry was posted in Design and tagged ASHANTI, best rapper alive, Birthday, breaking news, cash money records, design, Diana Macaraeg, Dwayne, Kendrick Lamar, Lil Wayne, lit, music, new music, Nicki Minaj, Nivea, rap, tha carter iv, Travis Scott, tunechi, uproar, Vaughn Lowery, XXXTENTACION‬, young money, ‪SNOOP DOGG on September 28, 2018 by wp360mag. 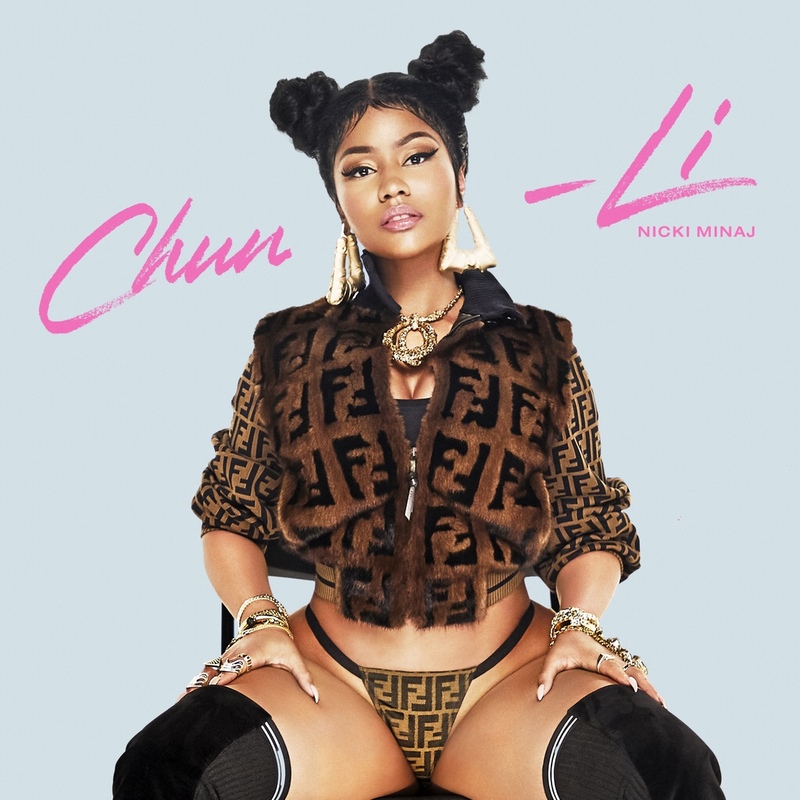 This entry was posted in Feature and tagged 360 Magazine, Apple, apple music, banger, Barbie, Barbie-tingz, Beats 1, breaking news, cash money records, chun-li, Diana Macaraeg, exclusive, hip hop, Interview, j.reid, live in studio, new music, Nicki Minaj, pop culture, radio, rapper, Republic Records, Vaughn Lowery, young money, Zane Lowe on April 12, 2018 by Pitch360. Building on widespread anticipation from fans everywhere, California rapper SAWEETIE uncovers her debut EP High Maintenance today via her own ICY label imprint in partnership with Artistry Worldwide and Warner Bros. Records. Not only does it include the runaway breakout hit ICY but it also boasts a total of eight new bangers from the MC. Get it HERE. Check out the full track listing below. Last week, SAWEETIE turned up with a fiery ANTIÉd; (Freestyle) music videoߞoriginally premiered by Rap-Up. Cruising in a classic car, she unloads a barrage of rhyme fury in the grainy seventies-style clip. Prior to the arrival of the EP, she appeared in CR Fashion Book, and VIBE claimed, The fierce competitor is out to show listeners that women in rap don’t need to follow anyone’s blueprint. She’s living up to those words! 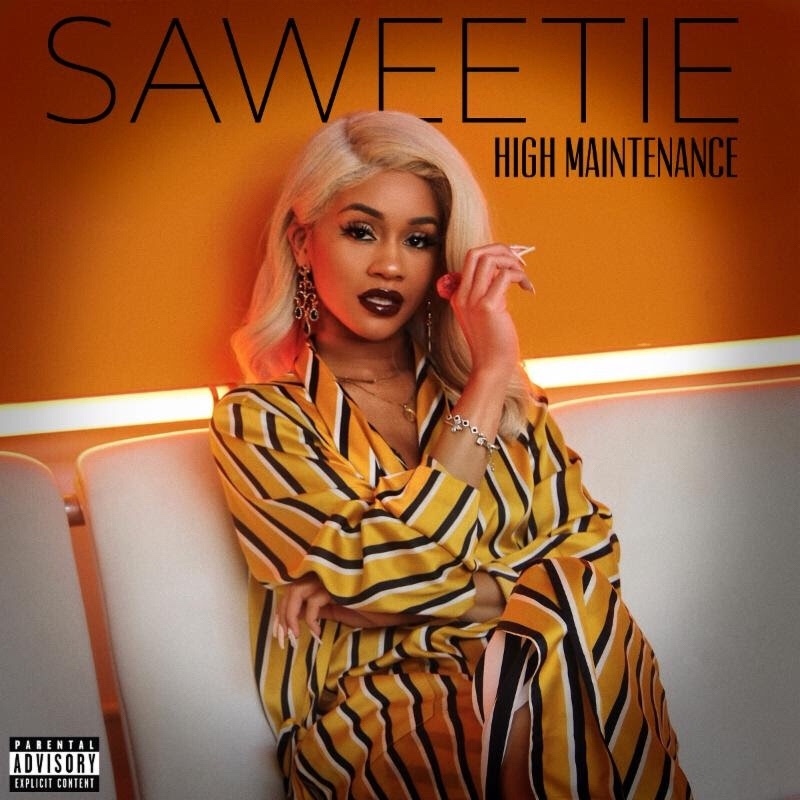 Featuring production from heavy hitters like Zaytoven and Cash Money AP, High Maintenance properly introduces SAWEETIE. From the infectious energy and deft wordplay of B.A.N. to a wavy send-offon the lush and lively Too Many, it highlights every facet of this formidable force. To celebrate High Maintenance’s impact, SAWEETIE took the stage at The FADER Fort and both the Pandora and HipHopDX showcases at SXSW in Austin, TX and brought the house down. 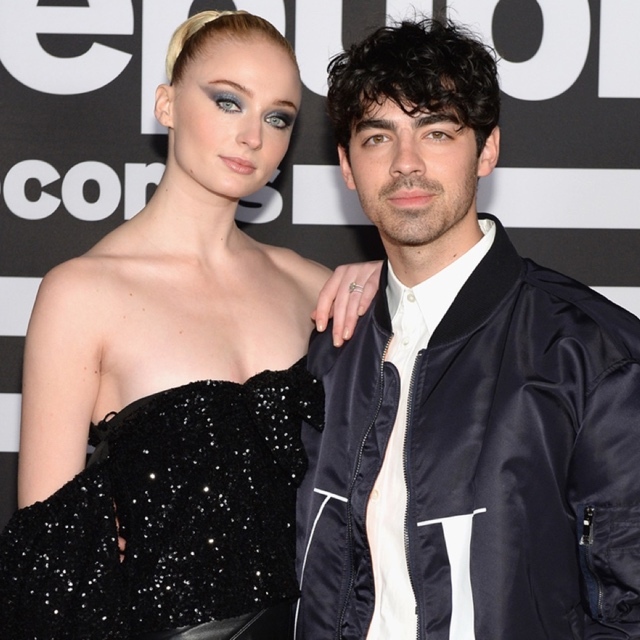 High Maintenance and SAWEETIE are here to stay. Flaunting nineties rhyme reverence, fashion-forward fire, and endless charisma, SAWEETIE born Diamont Harper can go bar-for-bar with the best of em. Drawing on a passion for poetry and numerous years of rapping in the car, she turned her love for words into vivid verses. Born in Santa Clara and raised in Sacramento, the California native attended USC. 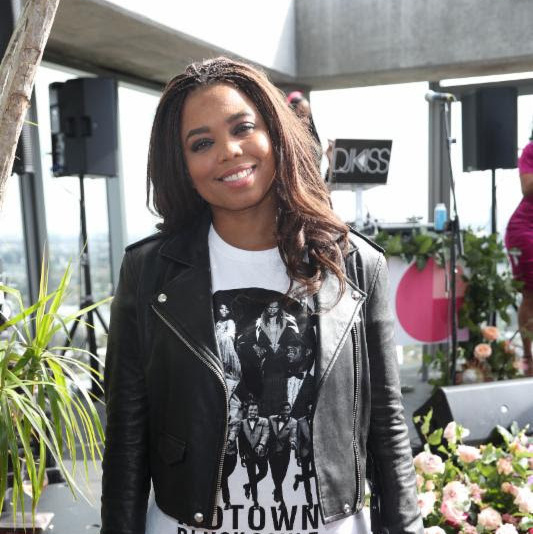 Initially, she deferred her rap dreams to achieve a degree in Communications before being discovered at a Downtown Los Angeles Puma event by current manager Max Gousse [Beyonce, YG, Ty Dolla $ign]. At Artistry Studios, she produced and recorded her 2017 knockout viral smash ICY GRL. Driven by a bulletproof flow and one clever line after another, it has racked up more than 18 million YouTube views and over 9 million Spotify streams and soared to #1 on Musical.ly. She also earned the early endorsement of gatekeepers such as Vibe, XXL, HipHopDX, and MTV. With a new partnership with Warner Bros. Records and Artistry Records for her label Icy, sheߣs rewriting the rule book and breaking the stereotype of the female emcee. Her forthcoming debut EP, features production courtesy of Zaytoven, Hassan, Saweetie, Cash Money AP, and Gousse. As a new CAA signee, she’ll be touring nationally throughout 2018. This entry was posted in Design and tagged 23, 360, 360 Magazine, agua, artistry records, bangers, bars, Beyonce, Burbank, California, cr fashion book, design, Diana Macaraeg, fader fort, good good, high maintenance, HipHopDX, ivy records, migos, mtv, new artist, new music, rap, respect, Santa Clara, saweetie, sxsw, Trap, Ty Dolla $ign, Vaughn Lowery, vibe, XXL, YG, young money on March 17, 2018 by Pitch360. 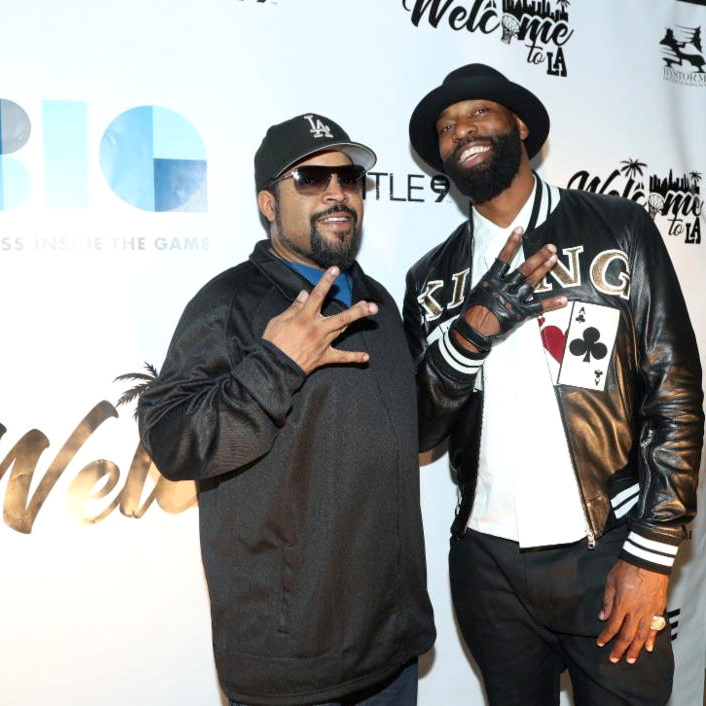 2-time NBA All-Star, Serial Entrepreneur and Master Connector, Baron Davis presented The BIG (Business Inside the Game) Power Summit events during NBA All-Star Weekend. An invitation-only traveling series of highly-curated summits, workshops, and immersive experiences utilized explore how to create real business and social impact, The BIG Power Summit assembled a network of upper echelon thought-leaders, industry experts, and rising stars from diverse backgrounds to connect, learn, and engage in dynamic, yet exclusive environments. 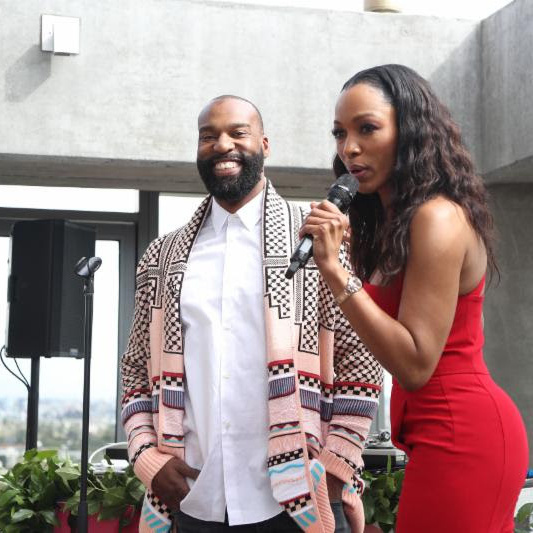 The Summit began with the BIG LOVEFEST Valentine’s Day Women’s Networking Luncheon at the Jeremey Hotel at West Hollywood, hosted by ESPN Sports Center Anchor, Cari Champion and sounds by DJ, television personality, and fashion model DJ KISS. 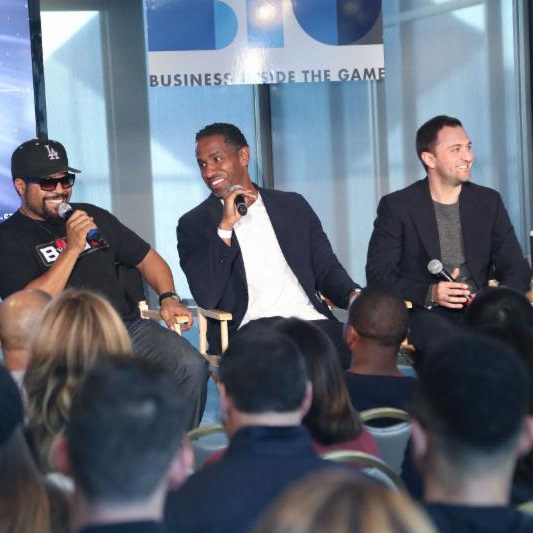 The event honored women in business, sports, and entertainment including motivating speeches by Los Angeles Sparks President/COO, Christine Simmons, ESPN Sports Center Host, Cari Champion, and Baron Davis. Curated to set the tone of celebration for the weekend with music provided by DJ, producer and photographer DJ D-Nice, who began his career in the mid-1980s with legendary hip hop group Boogie Down Productions. 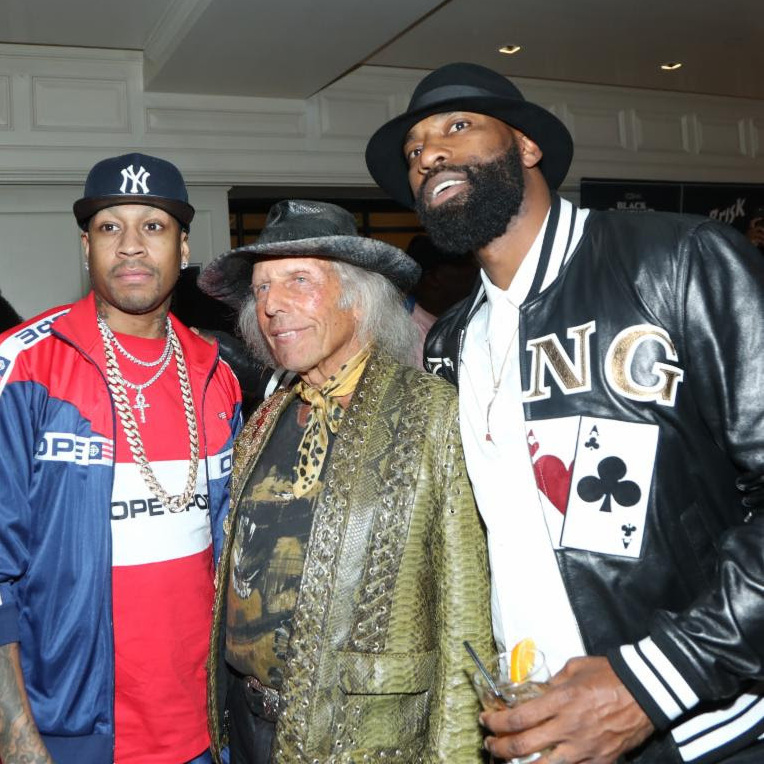 Attendees include: Ice Cube, Retired NBA Champion Matt Barnes, executive producer of VH-1’s reality TV series, Basketball Wives, Shaunie O’Neal, Lil Wayne’s manager/Maverick Management, Cortez Bryant (Young Money), retired NBA player Amare Stoudemire, NBA “super fan”; James Goldstein, and two-time NBA All-Star MVP, Allen Iverson. Panel attendees were treated to thought leadership at the highest level brought together to exchange future-forward ideas around how to create real business and social impact, collaborations and opportunities that live at the intersection of sports, media, technology and culture, disrupting industries, and enriching our communities. 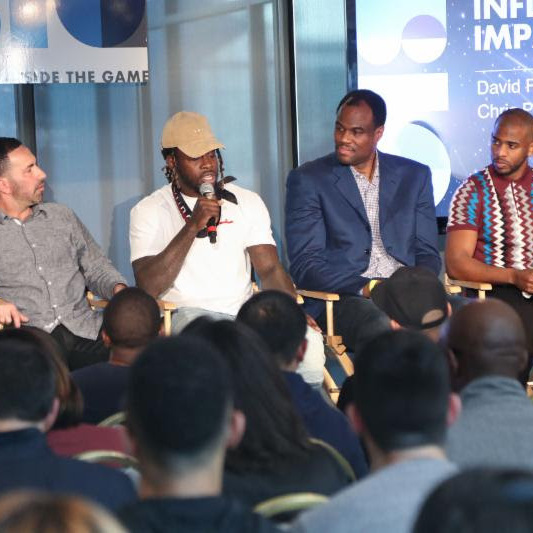 Panelists include: Rapper, Actor, Producer, ICE CUBE, NBA All-Stars Chris Paul and David Robinson, Co-founder and President of Lyft, John Zimmer, and others. A viewing party of NBA All-Star televised events immediately followed the panel. Additional panelists include: Film Producer, Scott Budnick, Philadelphia Eagles, Jay Ajayi, and Passionflix CEO, Tosca Musk (sister of Elon Musk). This entry was posted in Feature and tagged 360 Magazine, Actor, All-star, Allen Iverson, Amare Stoudemire, Anchor, Baron Davis, Basketball, Basketball wives, BIG Lovefest, Boogie Down Productions, Business, Business Inside the Game, Cari Champion, celebration, Celebrities, Celebrity, champion, championship, Chicago, chris Paul, Christine Simmons, collaboration, Cortez Bryant, creative, culture, culture magazine, Dallas, David Robinson, dj, DJ D-Nice, DJ KISS, edgy fashion magazine, entertainment, entrepreneur, espn, event, events, experience, explore, fans, fashion, future-forward, game, Global Society, hip hop, Hiphop, Ice Cube, industry, James Goldstein, Jay Ajayi, Jeremey Hotel, John Zimmer, launch, leadership, Lil Wayne, London, Los Angeles, lyft, Master Connector, Matt Barnes, Maverick Management, media, Miami, Milan, model, motivation, music, mvp, NBA, nba all-star weekend, Network, New York, opportunities, Paris, partnership, party, Passionflix CEO, Philadelphia Eagles, photographer, Power Summit, producer, rapper, San Francisco, Scott Budnick, shaunie O'Neal, Sneaker Shopping, social impact, social media, Sparks President, sport, sports, sports center, stars, super fan, Sweden, technology, Television, The BIG, The BIG Summit, The London Hotel, The Weeknd, Tosca Musk, USA, Valentines Day, Vaughn Lowery, vh-1, weho, west hollywood, women, Women's Networking, work, workshop, young money on February 19, 2018 by wp360mag. Bryan “Baby/Birdman” Williams was in Los Angeles pushing his new biographical documentary during his birthday. Today, it was released exclusively on Apple Music. The viewing was held on Thursday, February 15th at NeueHouse – a private community of leading entrepreneurs and creative teams. As we sipped on champagne and awaited the ‘Number 1 Stunna’ to introduce the opening instalment of a three-part series during his birthday, we were constantly reminded by the mere presence of security that we could be in for a ride. Over the last 21 years, Birdman has lead an army of hip hop prodigies, including Lil Wayne and Nicki Minaj. For decades, financial rumors and controversy surrounded Cash Money Records and we were hoping to find some answers. The initial episode delves into the CEO’s dark past from losing his mother at an early age to slanging drugs which in the end leads to incarceration. Throughout, we start to understand the attributes of how one becomes one of the most successful rap moguls of our time. His father was a former military man with a pile of small businesses in some of New Orleans’ seedier areas. He constantly hustled to keep his family fed with a roof over their heads. This boy “any means necessary” mentality trickled down onto his youngest child, which eventually contributed to him selling CDs out of his trunk and helming one of the most prolific indie labels in the world, Cash Money Records. 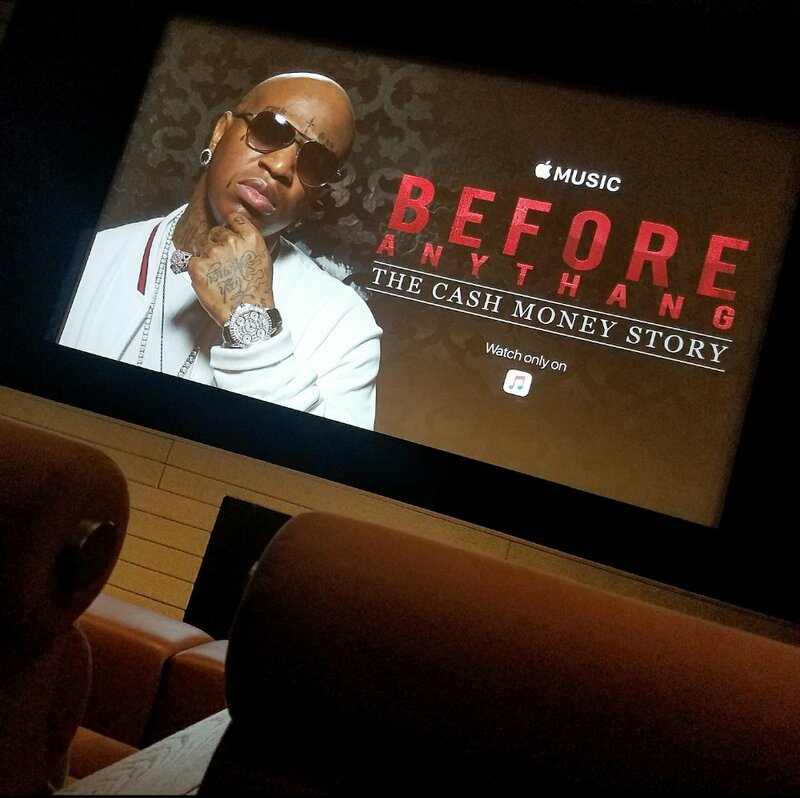 Before Anythang: The Story Behind The Cash Money Records Empire doesn’t disappoint; however, it may leave some leery as it was created by its star, sprinkled with his personal narratives, which could come across as being slightly contrived. Nevertheless, this piece of work has earned a spot on our ‘360 Watch List,’ especially since we gain an insightful introspective into the life of Birdman. This entry was posted in Design and tagged 360 Magazine, apple music, before anythang, BET, biography, birdman, breaking news, Cash Money, Celebrity, controversy, culture, Documentary, Drake, entertainment, Grammy, hip hop, Interview, la, lifestyle, Lil Wayne, Los Angeles, music, music industry, new orleans, news, Nicki Minaj, pop culture, rap, record label, trends, TV One, Universal Music Group, vh1, ymcmb, young money on February 16, 2018 by wp360mag. In addition to smashing and shattering numerous records, GRAMMY® Award-winning multiplatinum artist DRAKE earns his first career #1 debut on the Billboard Hot 100 with his latest single “God’s Plan” from his Scary Hours project. Moreover, he is the “the first artist ever to hit #1 on the Hot 100 based solely on streams” and the “first act to simultaneously debut two songs in the top 10 of the Hot 100 twice”. Impressively, it becomes the “first track to generate over 100 million streams first-week globally across streaming services” and achieves the “biggest 7-day total ever.” Additionally, it stands out as #1 on Billboard’s Digital Songs and Streaming Songs charts and #1 most added at Urban and Rhythm Radio formats. Returning to the chart’s top spot, this marks his first #1 entry on the chart with over 68 million U.S. streams and selling over 126,000 downloads. This is also the chart’s first #1 debut since May 2017. Upon arrival, it broke the worldwide record for “Apple Music’s First Day Streams”, generating over 14 million streams. It’s the #1 “Most Streamed Song” on Apple Music with a total of 60 million-plus streams in one week. 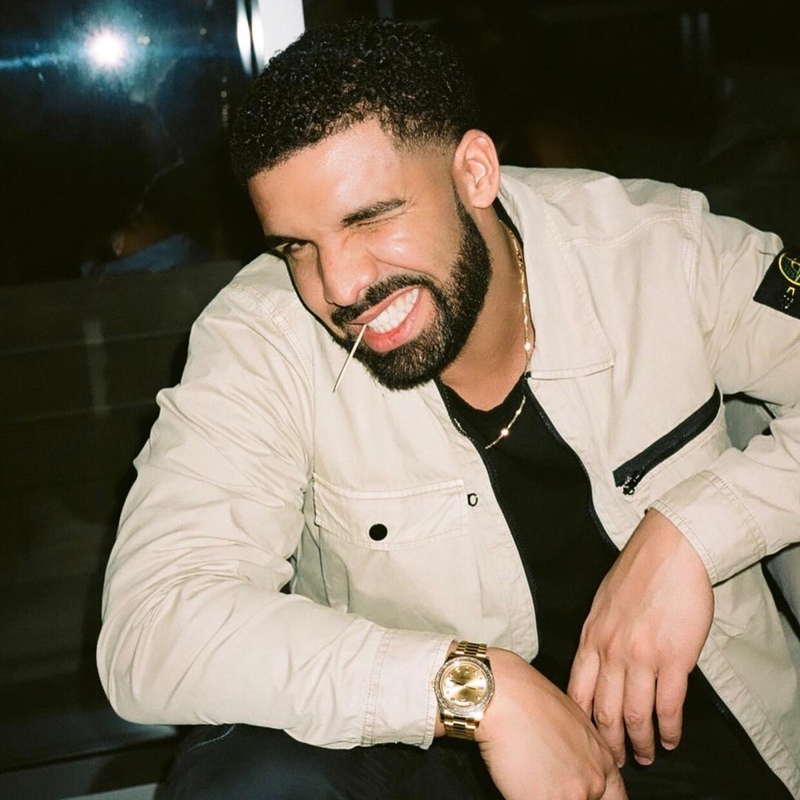 “God’s Plan” crushed the US Spotify record for “Biggest Single Day,” amassing 4.7 million streams on January 25 and gracing over 1,000 playlists to reach 100 million followers. Impressively, he bested his own record on the platform. Simultaneously, the song bowed at #1 on Shazam in under a week. 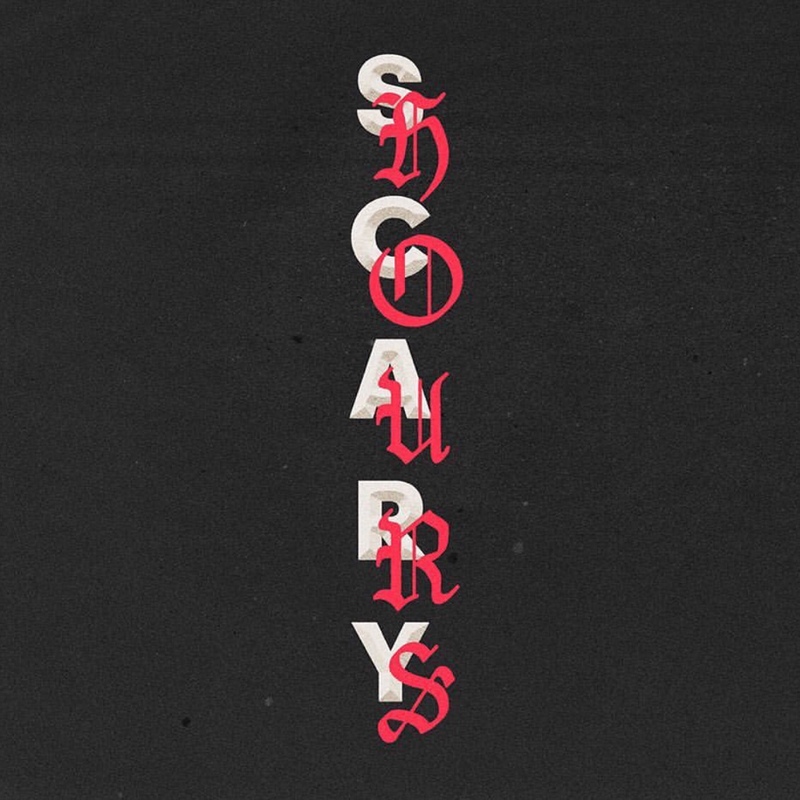 “God’s Plan” continues to dominate charts around the world, going #1 on Global Spotify, #1 on US Spotify, #1 Apple Music Overall, #1 Apple Music Hip Hop, #1 iTunes Overall, and iTunes Hip Hop. 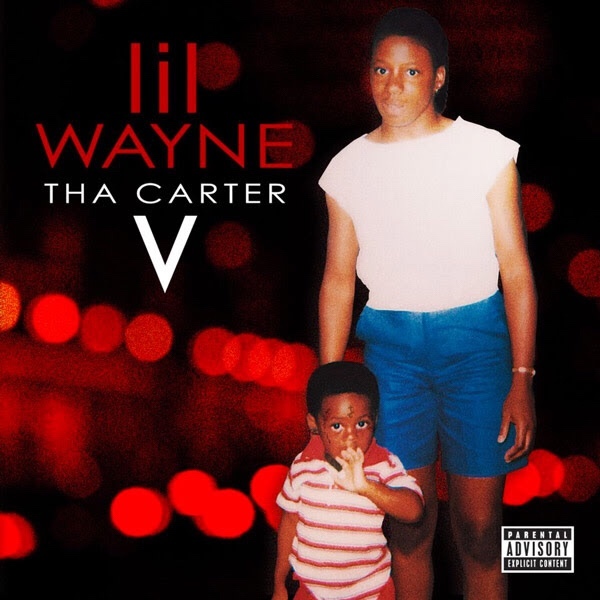 This entry was posted in Feature and tagged 360 Magazine, Apple music Grammy, Aubrey, Billboard 100, breaks record, California, career number 1 debut, cash money records, champagne Papi, dominating, Drake, first, Global Society, God’s plan, Grammy awards winning, iTunes streams, Los Angeles, nominated, number 1, top 100, top career, topping charts, Vaughn Lowery, Victor Harrington, young money on January 31, 2018 by vwardell.